This project aims to develop and utilize humanoid robots for analyzing behavior principles of children with ASDs and go beyond simple goals of using robots as a neat toy to make kids smile or maybe even engage in joint attention. Our goal is to use the robotic technology as co-robot to interpret behavior, determine if behavior is appropriate, provide feedback on different behavior, provide adaptation on for behavior therapy progress, and reward if behavior is improved towards therapeutic goals. We use Nao and Zeno, two commercially available humanoid robots and develop the necessary features such as facial expressions recognition, speech processing, and multi-modal feedback system for automatic interventions with children with ASDs. Families who would like to participate in this project can find information here. 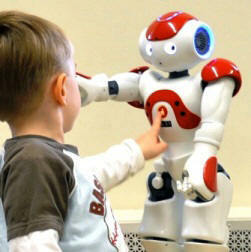 For more information on the Nao and Zeno humanoid robots, follow this link. Michelle J. Salvador, Sophia Marsh, Anibal Gutierrez, Mohammad H. Mahoor, “Development of an ABA Autism Intervention Delivered by a Humanoid Robot”, 8th International Conference on Social Robotics, Kansas City, November 2016. Mohammad Mavadati, Howard Feng, Michelle Salvador, Sophia Silver, Anibal Gutierrez, Mohammad Mahoor, A Novel Robot-based Therapeutic Protocol for Training Children with Autism, 25th IEEE International Symposium on Robot and Human Interactive Communication (Ro-MAN), New York City, August 2016. 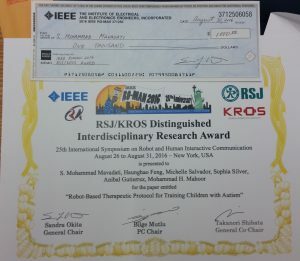 Received the RSJ/KROS Distinguished Interdisciplinary Research Award! Mohammad Mavadati,Howard Feng, Anibal Gutierrez, and Mohammad H. Mahoor, “Comparing the Gaze Responses of Children with Autism and Typically Developed Individuals in Human-Robot Interaction”, 2014 IEEE-RAS International Conference on Humanoid Robots. Mohammad H. Mahoor, S. Mohammad Mavadati, Howard Feng, Peyten Sanger, Sophia Silver, Anibal Gutierrez,“Using Robots As Therapeutic Agents to Teach Children with Autism Recognize Facial Expression”, IMFAR 2015: international Meeting For Autism Research.